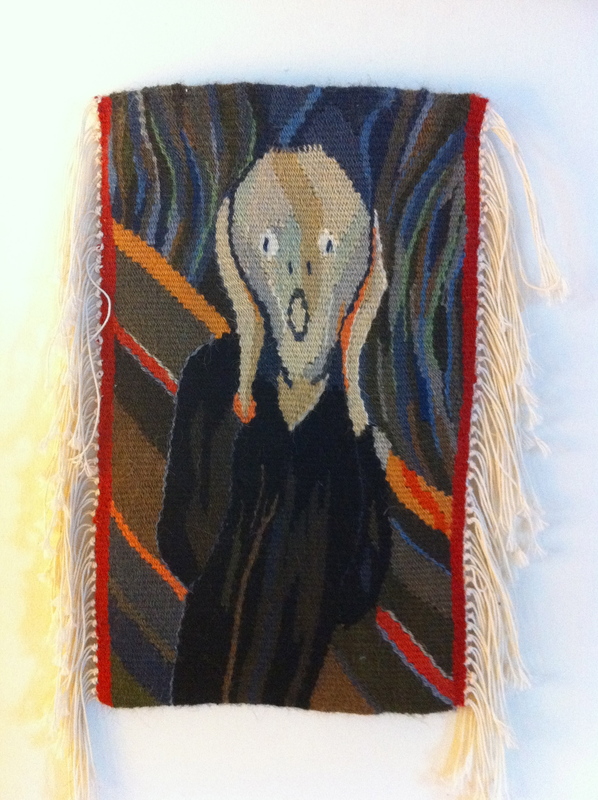 I have a long-term project underway, interpreting Edvard Munch’s Scream painting in a variety of textile techniques. It began with a small tapestry. The image and the tapestry have great meaning to me. While I was weaving my then-teen-age son stopped by the loom, looked at the image I had clipped to the edge, examined the partly-done piece, and exclaimed, “They look just alike!” It’s not easy to impress a 16-year-old, so it’s a fond memory. One of the Scream paintings is set to be sold this spring. (New York Times story) $80 million is expected! I’ve displayed my Scream tapestry many times in the past few years, and been asked if it is for sale on several occasions. Oh no, I said, it would cost way too much. I wonder. If I charged $1200 (that would surely cover a plane ticket to Norway), it would be only .000015 the cost of the real thing!